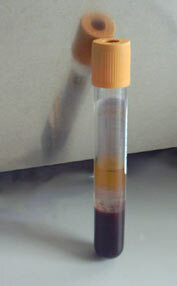 Blood serum is the clear fluid that remains after the cellular components (red cells, white cells, platelets, clotting factors and fibrinogen are removed. It includes all proteins not used in the clotting process. What follows is a collection of quotes from Watchtower Society literature. This information will help researchers understand the historical development of the Watchtower Society’s policy on blood serums and document the many changes in policy through the years. Quotes are presented in chronological order. Our editorial comments are in red. Note that the Watchtower policy changed six times in the twenty year period between 1958-1978. 1954 – Blood serums are wrong. “We are told that it takes one and a third pints of whole blood to get enough of the blood protein or “fraction” known as gamma globulin for one injection. And since from the foregoing it must be admitted that such use of human blood is highly questionable, what justification can there be for the use of gamma globulin? Further, those interested in the Scriptural aspect will note that its being made of whole blood places it in the same category as blood transfusions as far as Jehovah’s prohibition of taking blood into the system is concerned.” – See Leviticus 17:10 – 14; Acts 15:20, 28, 29. The following three quotes are from the booklet “Blood, Medicine and Law of God” released in the summer of 1961. It left some Jehovahs’ Witnesses confused since it appeared that the WTS had once again changed its position on blood serum. 1961 – Blood serums unclear. This article did little to end the confusion but the message seemed to be that vaccines are an acceptable contamination, blood fractions are wrong, and substances made with blood were objectionable. In the coming months, members would ask for and receive more clarification from the Watchtower Society. In addition to once again banning blood serum and anything else from blood, the Watchtower publishes blatantly false medical information by arguing that “blood serves the same purpose as food when taken into the stomach”. For blood to serve as food it must be digested and broke down into amino acids, etc. No digestion occurs in the blood stream. An even softer position on Blood serums. – The Watchtower 06/15/1978 pp. 29, 30, 31. This is another example of publishing inaccurate or incomplete medical advice. Practically all blood components have been shown to cross the Placental Barrier. See the article “Watchtower Position Crumbles”. Note: The writer of this article seems to be unfamiliar or simply chose not to acknowledge the bizarre history of the Watchtower’s blood serum policy. Incidentally, the blood based RhIG injection requires that the patients blood be cross matched and typed, and they generally receive the same type of wrist ban worn by other blood transfusion recipients. I do wonder how many of the changes to WT policy generally have come about via big law suits or legal action by authorities. I believe that many of these changes in the 1950’s were the result of the requirements of the US Govt. that all persons travelling outside US boundaries be immunized or inoculated. The ramifications to the missionary work would have been great in a negative way without the ” new light”. In light of the continual flip flopping, and the way “options” are approved and disapproved, and sometimes reapproved, even as far as flat out saying anything made from or with blood is wrong and then approving such methods later, or then saying such methods are a personal decision each Christian must make, it appears that we’re being experimented on. For being such an important matter of obedience to Jehovah, why is it, in the first place, so unclear in the Bible, and then, why does our understanding of what it means, flick off and on, instead of gradually becoming clearer and clearer, building upon what was first advised by our faithful and discreet leaders? Als gedoopt lid (ruim 40 jaar gemeente verkondiger) wil ik graag mijn standpunt inzake bloed toelichten. In de loop van vele tientallen jaren is het standpunt van het WT-Genootschap veranderd inzake wat wel of niet aanvaardbaar is met betrekking tot bloed. Medisch gezien is er steeds meer mogelijk. Wanneer is bloed nog bloed. Als er uit menselijk bloed een component verwijderd wordt is het dan nog bloed? Als je bijvoorbeeld het water uit plasma verwijderd spreken we dan nog over volbloed? Een transfusie van welke component of fractie wel of niet aanvaardbaar is voor Jehovah weet niemand. Mijn standpunt is ieder moet met zijn eigen geweten een beslissing nemen inzake bloed. De zaak is te gecompliceerd om een zwart/wit standpunt in te nemen. Er zijn te veel vragen van wat wel of niet aanvaardbaar is. Het WT-Genootschap weet het ook niet meer wat nu wel of niet aanvaardbaar is met een medische ingreep. Jammer dat zij voor broeders en zusters toch nog grenzen willen stellen inzake deze materie. Zo ontstaan er standpunten die zij zelf niet meer kunnen uitleggen en ontstaat er veel onvrede. Alle fracties aanvaardbaar, componenten niet. Alle fracties bij elkaar vormen weer componenten???? Ik heb alleen nog de hoop dat het WT=Genootschap tot inzicht komt en broeders en zusters de keuze van hun geweten laat maken als de bijbel geen directe oplossing biedt.